Εξασφαλίστε μια εκπληκτική τιμή στο Hotel Kartause Gaming - με βαθμολογία 8,8 από πρόσφατους επισκέπτες. Breakfast as always in Austria great. Nice place to stay. Historical aura, beautifully renovated old building. The beer of the house is very good, the dinner at the restaurant is delicious. Veru good breakfast and good lunch. Nice place to stay. Visited last year...enjoyed it. At that time they only had WiFi in the restaurant. Now it is available overall, including rooms. The stop this year, however, was a bit disappointing. The restaurant prices were higher. The double room I reserved was smaller than the one I had last year. The home-brewed beer was only available in 0,33 unlike 0,5 last year. The biggest disappointment was the breakfast! Last year I remember sausages, bacon, and scrambled eggs available. This time there was just hard boiled eggs, no bacon, no sausages....only sandwiches, some fruit, yogurt, bread and cereal. Just had OJ and some coffee and ate at McDonald's on the way home. Die Dame an der Rezeption war sehr freundlich und konnte Fragen zur Kartause gut beantworten. Die Zimmer liegen in der Klosteranlage, die sehr aufwendig renoviert wurde. Der Innenhof ist sehr schön und besonders abends total idyllisch. Bedienung herzlich. Tolle Berücksichtigung meines Geburtstages am Anreisetag! Die Lage, der geschichtliche Hintergrund und die Atmosphäre der Kartause ist sehr prägend und verschafft (innere) Ruhe. Speisekarte gut sortiert, Mahlzeiten sehr gut. Sehr gute und schöne Lage. Großer Komplex mit ausreichend Möglichkeiten zu Essen. The food was incredible at the Hotel restaurant. The staff very friendly. Absolutely charmng!!! Everything was above expectations. 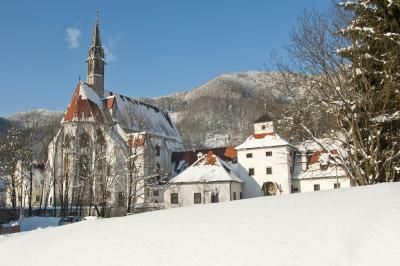 Located at the foot of a forest, Hotel Kartause Gaming offers exclusive accommodation in a 14th-century monastery, halfway between Salzburg and Vienna. It features a brewery and a restaurant. The carefully furnished rooms at Kartause Gaming Hotel feature individual interiors, focusing on details such as wooden beams in the ceilings, glass walk-in showers and traditional hand painted furniture. All rooms come with free Wi-Fi and cable TV, and some include large living areas. At the restaurant, guests can enjoy Austrian seasonal specialties and a rich buffet breakfast. The hotel’s courtyard is home to several events during the year, such as arts and crafts markets. Guests can also take a guided tour through the monastery's brewery, which includes a beer shop. Το Hotel Kartause Gaming υποδέχεται επισκέπτες της Booking.com από 7 Φεβ 2011. This room has a bathroom and a TV. Διαβάστε πριν κάνετε κράτηση Το Hotel Kartause Gaming δέχεται ειδικά αιτήματα - προσθέστε τα στο επόμενο βήμα! Μέχρι 3 παιδιά κάτω των 12 ετών χρεώνονται EUR 25 ανά νύχτα όταν χρησιμοποιούν το υπάρχον κρεβάτι. Αυτές είναι οι κάρτες που δέχεται το Hotel Kartause Gaming και διατηρεί το δικαίωμα να δεσμεύσει προσωρινά ένα ποσό πριν την άφιξή σας. Αεροδρόμιο Blue Danube του Linz (LNZ) 75,2 χλμ.